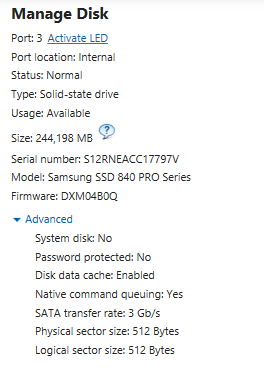 I have created 2 new volumes on the SSD (Samsung 840 Pro 256GB) from the previous OS installation before re-installing Windows 8 Pro 64 bit on it. which are very low (about half) compared to the results it should return. Any ideas what it could be? Or how to diagnose? Any ideas on how to make it work in SATA 3 mode instead of SATA 2? 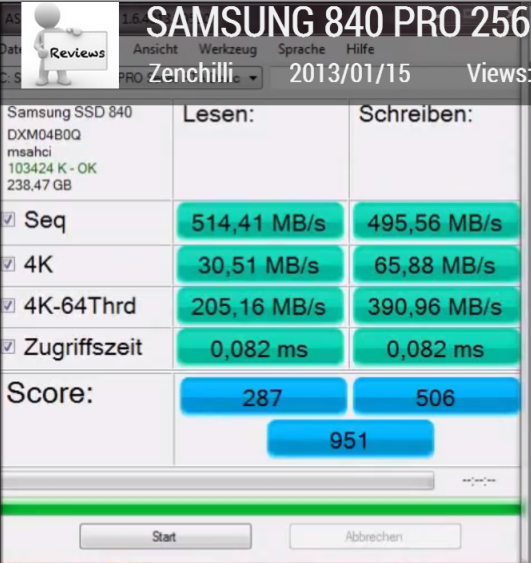 I am thinking that it might have something to do with the HDD which cannot work at more than SATA2. Maybe, even though the 2 SATA ports are SATA 3 compatible, the main one in which the HDD is connected is faster, or maybe the HDD is limiting the SDD speed cause it has to use SATA2. It seems your drive is currently running at SATA 2 speeds (due to interface limitation probably). The problem with that, is that it tops at 300MB/s theoretically. So with some loss, the speeds you are getting are logical. 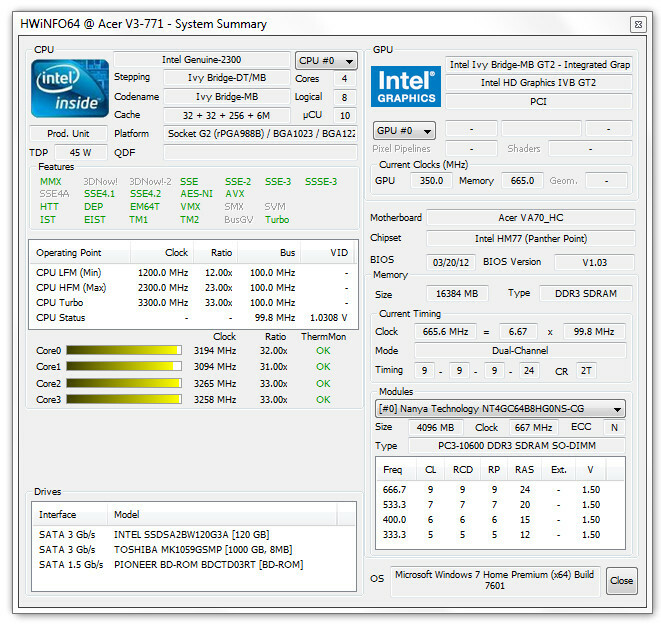 The Acer V3-771G laptop is not able to run the 2.5 HDD slots at SATA3 speeds. You can see in many reviews in internet (in HWinfo screenshots) that the drives run on SATA2 mode (see NotebookReview image). This doesn't kill your overall system's reactivity, but sequential read/write speed (not really relevant out of benchmark) will top around less than 300MB/s. Write caching may not be properly enabled and worth going through a few steps to check. If Enable write caching on the device is already ticked then un-check it then click ok.
Now retick the box and click ok.
Not the answer you're looking for? 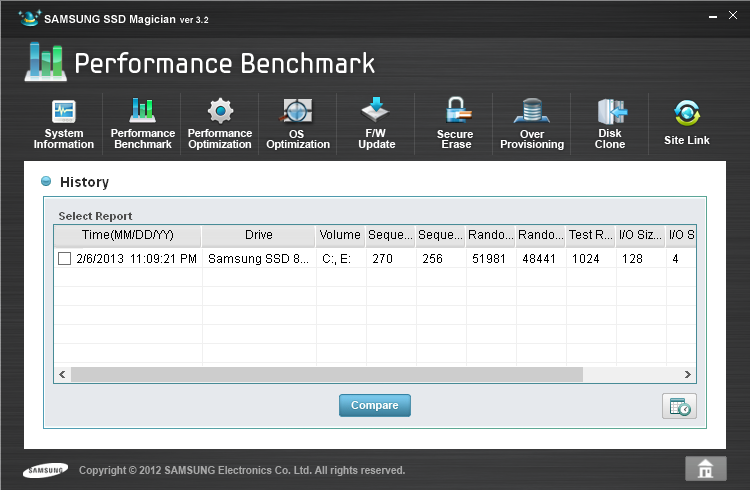 Browse other questions tagged performance ssd speed or ask your own question. Does RAID 0 (striping) with two SSD hard disk make any sense? Split database index and table files with SSD? 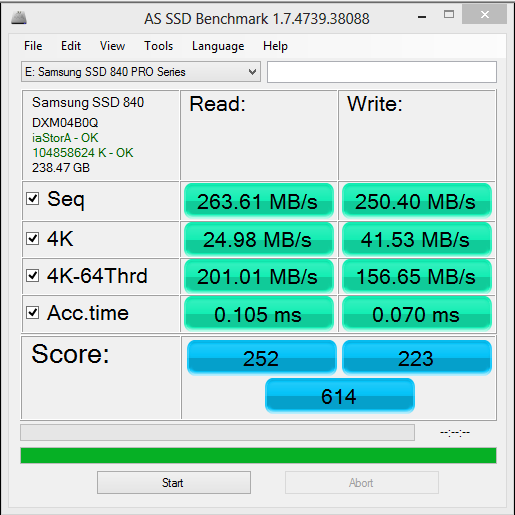 Is RAPID safe for a Samsung SSD (850 evo)?